Where PPM is the buff’s build in constant, H is our current haste rating and T is the time since the last attack that gave a chance to proc or duration of the buff. What is most interesting to notice is how our haste rating affects the proc frequency of our trinket. What does that mean in practice however? Lets take a look at the tables below. The first table represents the first soft haste breakpoint at 12.51%, the second table the second soft haste breakpoint at 20.01% and the third table the third soft haste breakpoint at 24.97%. These values are representative of our choices for 5.2patch. The first 4 trinkets will drop from different bosses in the new raid while the 5th one can be purchased for Valor points upon reaching Friendly with the new faction Shado-Pan Assault. Before we analyze how haste affects the new trinkets there is much to be discussed about their potency. First thing to notice is how their primary stats are exactly the same whether the passive bonus is intellect or spirit. For every trinket of any item level the values remain the same. Whether this is something Blizzard intended we cannot know since 5.2 hasn’t officially been released and as always there might be changes when it goes live. Onto the trinkets themselves. The Soothing Talisman of the Shado-Pan Assault is the only trinket in 5.2 with an on use faction on CD. While it’s a great upgrade for the Relic of Chi Ji and even some very high versions of the Spirits of the Sun, its long CD is somewhat discouraging and for shorter fights its MP5 will be practically considerably shortened. Choose wisely on the start of the tier depending on the duration of the fight. From the 4 remainining trinkets 2 have passive spirit with a shield proc and 2 have passive intellect with a strong throughput proc and MP5 gain each. We arrive in certain conclusions while comparing them in pairs and then cross comparing them to each other. The passive spirit based trinkets share the same MP5 and a shield proc which is applied quite differently. Stolen Relic of Zuldazars proc is based on accumulating a stacking buff of 6charges which can be released at any given time onto a target shielding them from damage. While it doesn’t have an ICD it does have an internal cooldown of 20seconds that prohibits you from unleashing it at 1 or 2 stacks. The least amount of stacks that can be released is from 3 and beyond for a 31629 / 42172 / 52715 / 63258 shield. 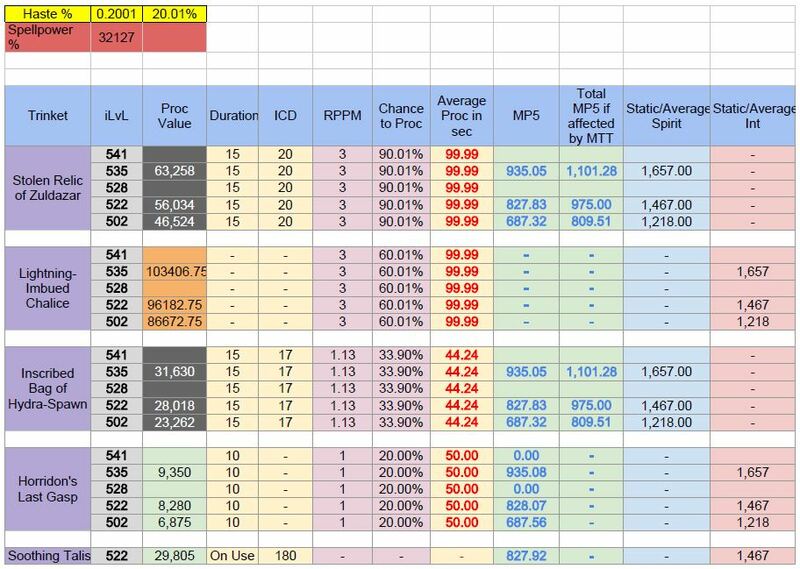 Its RPPM is set on 3 and from the table above we can see that the maximum average amount of accumulating 6 charges for the maximum effect is 107sec at 12.51% haste ( 871 haste rating while raid buffed). The advantage of this trinket is that its on use ability gives us direct control on the applied shield. We can choose when to apply it and to whom. Onto the Inscribed Bag of Hydra-Spawn. Its difference from the trinket above is that the shield proc is random and it occurs roughly every 47sec at 12.51% haste. In direct comparison to its contender we can see that its theoretical ICD is shorter ( for a shield of 31629K the difference is 6seconds making the Inscribed Bag of Hydra-Spawn roughly 11.50% faster on its application) however its random proc nature makes it less attractive. At this point it should be noted also that a shield works differently from a direct heal, meaning it has lower chances of being an overheal and therefore wasted HPS. If the damage profile of the fight is constant damage the Inscribed Bag of Hydra-Spawn will prove more useful but if the damage of the fight comes in waves then Stolen Relic of Zuldazars controlled shield will provide with better HPS. Which trinkets are BiS for this tier? At this point it is really hard to tell which 2 of the 4 presented trinkets are the clear winners. While myself I tend to choose passive intellect based trinkets I have to admit that the shield procs are very attractive. I will ultimately choose depending on the fight ( if there is the luxury of having all the trinkets) and its damage profile. 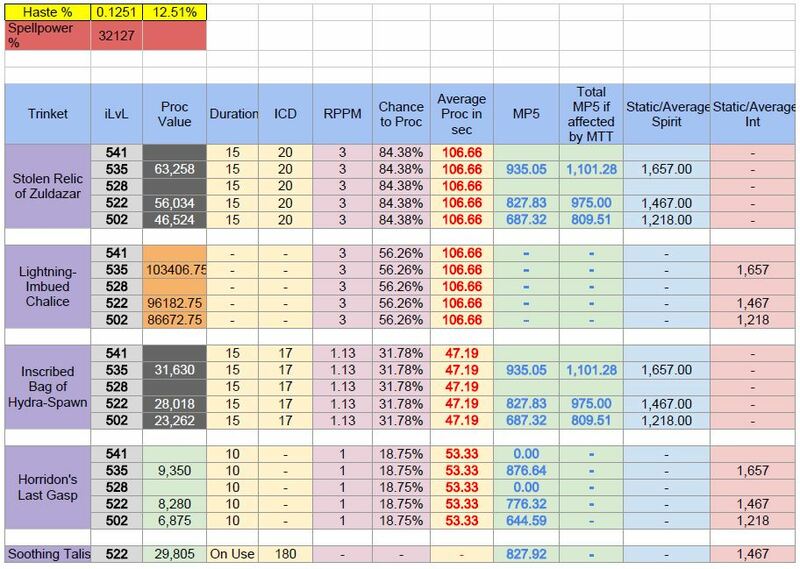 Last but not least I will leave you with extra tables depicting how haste influences the potency of RPPM based trinkets. Higher haste rating will shave off quite a lot of the time between procs making haste a more desirable stat for 5.2 than 5.1. While you might be allocating some points to haste however bare in mind that crit and mastery haven’t lost their effectiveness although if you are aiming for numbers the faster you are ( if your regen can sustain you) the higher you will go. Ironically both shielding trinkets come with a passive regen boost making a case for potentially hoarding some haste rating while equipping them. My big thanks to Binkenstein for confirming the proc numbers for the RPPM trinkets. This entry was posted in Theorycrafting and tagged 5.2, Cooldown, Healing Trinket, Horridon's Last Gasp, Inscribed Bag of Hydra-Spawn, Lightning-Imbued Chalice, new ICDs for 5.2patch, RealPPM, Soothing Talisman of the Shado-Pan Assault, Spirits of the Sun, Stolen Relic of Zuldazar, Trinket. ← Glyph of Water Shield: Friend of Foe? Soothing Talisman on a 5min fight will give 29805 x 2 mana (you use it once after you spend 40k mana very early and again 3 minutes afterwards). In general, the fact that you can get the mana on demand at the start of every 3 minute period will probably make the VP trinket superior in the vast majority of encounters. While this is correct there have been many fights were I don’t drop my MTT the first 60 sec of the fight. I was thinking more or less of the same lines when it came to comparing these trinkets. To be honest however it seems we will be stacking more haste come 5.2 which will make Horridon’s Last Gasp superior by default. In any case if there is a fight where the VP trinket is still better people should use it, I will also.